Available at Broadway Records, iTunes, and sites online! 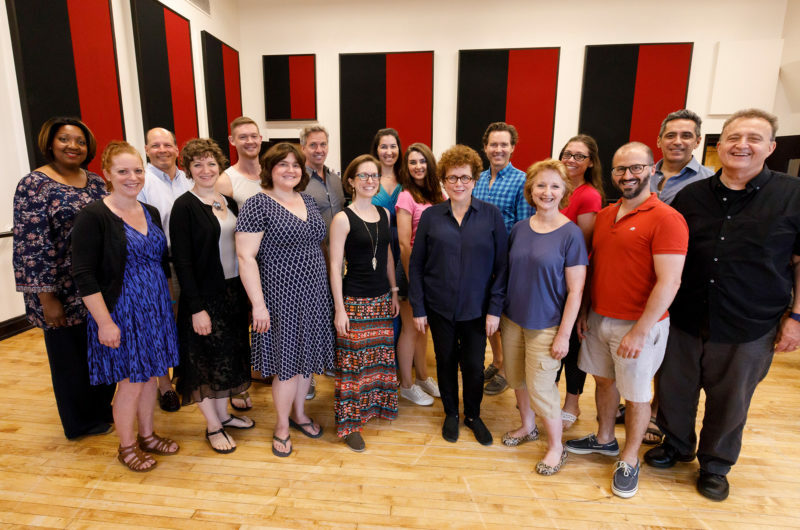 Judith Clurman’s Essential Voices USA (EVUSA), one of New York’s preeminent choral ensembles, brings together a roster of seasoned professionals and auditioned volunteers. With this unique choral model, created by Clurman, the size of the ensemble is constantly changing, dictated by the specific musical needs of each project. 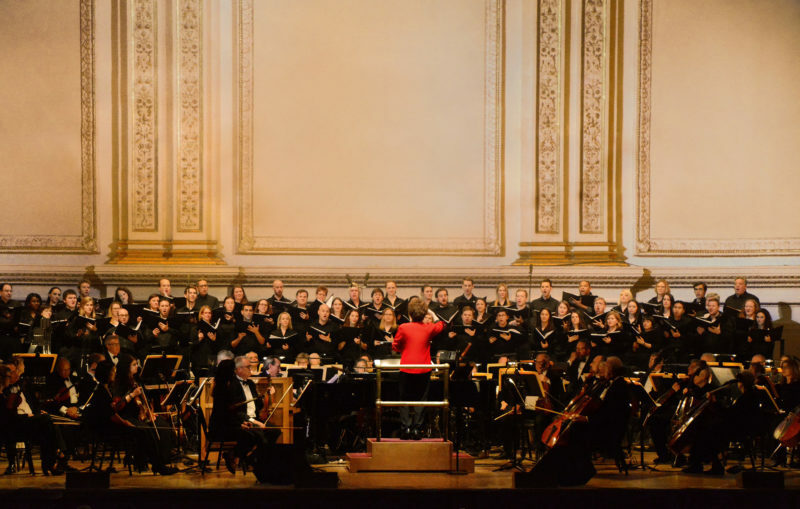 Enrich the lives of our singers, the New York community, and our audience-at-large by sharing our dedication to excellence and our deep love of music. Regularly on stage with the New York Pops in its Carnegie Hall subscription series, televised on NBC’s July 4th Macy’s 2014 Spectacular Fireworks and the Rockefeller Center Tree Lighting, the ensemble comprises a talented roster of seasoned professionals and auditioned volunteers, dynamically fitted to the unique needs of each project. 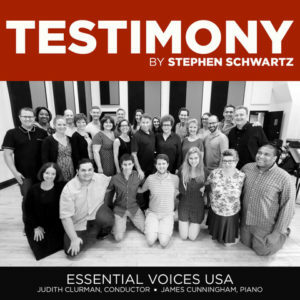 During the 2017-2018 season, EVUSA will launch recordings by Judith Clurman, Shawn Crouch, Jeremiah Klarman, and Stephen Schwartz’s “Testimony” for Broadway Records. They will be heard at Carnegie Hall, the National Cathedral in Washington D.C., and Brooklyn Heights Synagogue. EVUSA participated in the 2013 Presidential Inaugural activities; and held a month-long residency at National Public Radio. The ensemble has performed with a diverse and impressive array of artists including the young opera sensation Jamie Barton, Broadway star Idina Menzel, musical theater luminaries Marvin Hamlisch; Sheldon Harnick; Larry Hochman; Stephen Schwartz; Alain Boublil and Claude-Michel Schönberg; and Lynn Ahrens and Stephen Flaherty. EVUSA has premiered works by composers Milton Babbitt, Jennifer Higdon, Nico Muhly, and Howard Shore. The group currently produces The Composer Speaks at the DiMenna Center for Classical Music, a series of musical performances complemented by panel discussions with composers and lyricists. EVUSA Youth Workshop provides select high school students the opportunity to participate with the main ensemble in the heart of New York City’s music scene. They have recorded works of Marvin Hamlisch and Howard Shore. 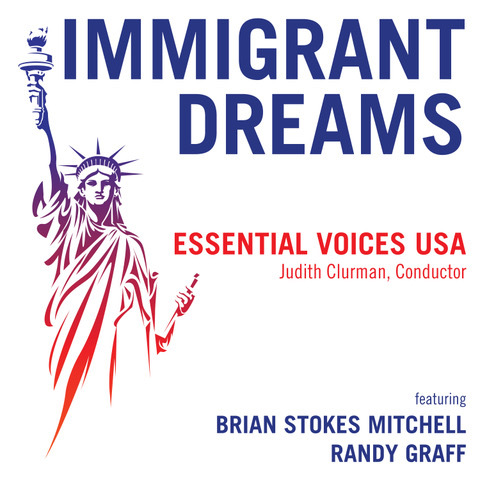 The ensemble’s recordings include Celebrating the American Spirit, Cherished Moments: Songs of the Jewish Spirit, Holiday Harmonies: Songs of Christmas, and Season of Light: Songs of Thanksgiving, Christmas, Chanukah, New Year. To learn more about EVUSA and membership, find us on Facebook.